Microscoic image of the head of a fly, several pictures combined to one. Today I started to go through several permanent slides which I borrowed – and the result can be seen on the right. 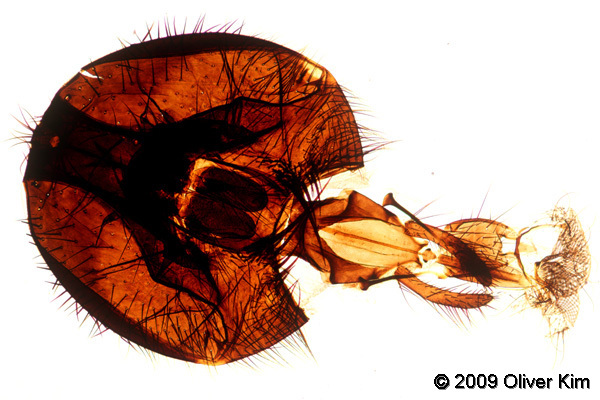 This is the head of Musca domestica, the common house-fly. I took seven overlapping pictures and assembled them with a stitching software (which are commonly used for making panoramas). The pictures were stitched in two dimensions, not every panorama software is able to do this. Many are only able to stitch the images horizontally only. Naturally I also had to do some cleanup work in Photoshop, removing the dirt and dust of the background. The specimen was sufficiently thin, so I did not have to combine the different focus levels into one final sharp image. The house fly is one of the most widely distributed insects and can be a vector for the transmission of a range of different illnesses. An adult female lays about 500 eggs during its lifetime. Maggots hatch within one day. They will feed on decaying organic matter and grow into a fully sized larva. Pupa will form and after metamorphosis the adult flies will emerge. Adult flies are 6-9mm long, and will mate already 36 hours afterwards to complete the life-cycle.